Hey Ladies!!! It’s time for our October Challenge. 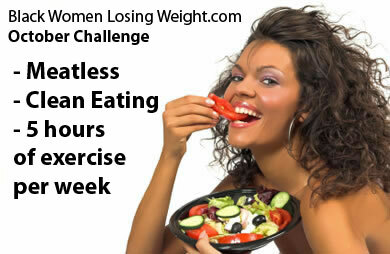 We will begin on OCT 1, 2012 with 3 goals – Meatless, Clean Eating, 5 hours of exercise each WEEK. I hope you consider all of the goals, but ultimately it’s up to you what you chose to do. If you only want to do 2 out of the 3 for example, that’s fine. If you want to eat fish, that works too. The goal of our monthly challenges is that Black Women Losing Weight members try new positive habits that can enhance their weight loss efforts. You are committing to these lifestyle changes for a whole month! Determination is KEY!! I will post resources and links daily on our Facebook page, online community, and here on the blog to help you stay on track. Decide what parts of the Challenge you want to commit to. – Meatless Eating, Clean Eating, 5 hours of Exercise EACH Week. Each Saturday you will check-in and give a status of how the week has gone within our online community, www.blackwomenlosingweight.com. You can do this as a blog post or status message on your profile page. You can also post to our Facebook page to let your BWLW sisters know how the Challenge is going for you. This is how keep each other accountable and encouraged. You will also be able to discuss the challenge every monday night during our LIVE weight loss support chats. October Challenge Goals – This is what you are committing to! We are going MEATLESS for 31 days – That means no fish, no chicken, no pork, no beef, no bison…no flesh foods. If it has a mom, we aren’t eating it. In essence we are going vegetarian for 31 days. You will need to consider how you can cook more and plan your meals. I will provide a number of resources for you daily via Facebook and here on our blog.I suggest that you take a B12 supplement or B-Complex supplement at least 3 times per week while going meatless. Most multivitamins have B12 in them as well.If you are wanting to continue our September Smoothie Challenge for another month, please do so as part of the meatless goal. Oh, Eggs are optional. It’s up to you. We are committing to CLEAN EATING for 31 days – What is clean eating? When you eat clean you will be eating unprocessed, whole foods that are cooked in ways that don’t add a lot of extra chemicals and toxins. We are talking fruits, vegetables, tofu, soy, whole grains, lots of water, healthy dairy, fresh juice, and lean meats.We will be working to avoid fried food, white flour, artificial ingredients, soda, commercial juice and sugary drinks, processed sugar (white sugar, corn syrup), foods with preservatives and extra chemicals, saturated fat, and trans fat. We are committing to WORKING OUT FOR 5 HOURS EACH WEEK – You can work out at home with DVDs. You can work out in the gym. You can walk at work or in your neighborhood. It’s up to you. Running, yoga, weight lifting, walking, jumping rope, pilates, spin class, zumba…the choices abound. The goal is that you commit to 5 hours of exercise each week. Challenge Resources – Here are a few links to get you started. www.eatcleandiet.com – The Eat Clean Diet Books are great if you want a plan that lays everything out for you. Gracious Pantry: What is Clean Eating? Clean Eating Lifestyle – Examples of what daily eating looks like and shopping lists. Don’t forget to exfoliate and moisturize skin. Use spf30 on your face. I would love to do this challenge. I know it’s going to be hard because am never home to cook. Not only am I not home. I’m not a great cook either. But I managed to lose 10 pounds last month. Now I am working on the ‘October Challenge’ with this beautiful web-site. 2 LOW FAT FROZEN DINNERS, one Breakfast and one Dinner. I counts my points; although I’m not a member of the WW club. Plus 1 big salad with salad dressings…only 2 TBS. Eat lots of veggies. I’m going meatless this month. But I eat about 4 eggs per week. Sometimes only the egg whites. Watch the dairly products! I’m a cheese lover, so be careful; if you are too. Pavolone cheese is very low in calories…I think? 1 yorgurt cup – Lowfat, anybrand you like, or 1 delicious spinach smoothie (There are recipes everywhere). And most importantly 64 ozs. of water daily, preferably Akaline water, but tap or bottled water will do the trick too. Well nice meeting you, and the very best success for us this month. I am going to do all three challenges. Meatless, clean eating and 5hrs of excerise a week. I got it, and I am in. I don’t know why but, “I AM IN!” I just finished grocery shopping and restocked my freezer with, meat! It will have to wait, I am going meatless, eating clean and exercising 5 hours a week! Yeah Me! I am going yo do clean eating and 5 hours a week exercise. I am ready and excited … this going yo br great because I include my husband and my youngest daughter to do the challenge with me. This will be the first challenge I participate in but I’m so I will be doing the clean eating and exercising 5 hours each week! Excited about the new challenge. And I super excited about the new me that will be unveiled. I feel an extra 5 lbs creeping on and it must go…I am definitely on this challenge…Wishing all my BWLW family all the inspiration in the world…let’s do this! My daughter and I are going to attempt to do this challenge. I’ve never gone “meatless” but I have gone without red meat. Looking forward to the challenge!!! I do not eat meat a lot, and can go meatless. But this evening just happens to be the day I have have 4 very small chops in the oven covered in bbq sauce. So after eating the chops I will return to meatless. I will begin attending All Fit gym tomorrow. I have a personal trainer, which I was thinking about but decided after my physical assessment last Wednesday. I committSo after the chops are eaten I will committ to no meat and exercising no less than 5 hours weekly. The clean eating may not begin tomorrow, I know me, as I will have to plan for this. Plus I do not cook a lot. a personal trainer is I want a change. Sometimes I could just cry constantly asksing myself how is it I did not see this weight getting on me. People ask why I want to loose weight. My response is always, ‘because of what you can’t see.” I welcome this additional challenge. I know if I stay committed and do what I need to do the best I will succeed. This is my first challenge & is doing all 3!!!! I am determined!! I plan on doing the clean eating and 5 hour workout. As far as meatless goes, I’m going to stay away from red meat. Let’s go ladies! I’m going to commit to all three, but I may eat seafood from time to time. I’m going to do 2 out of 3 eat clean and 5 hours of working out each week. As for going meatless this is something I will work on, for now it will be grilled chicken and fish. I am all in !!! I’m going to do clean eating and 5 hours of exercise. This is my first challange, I’m so excited and ready to get started. I’m in!! Doing 5 hours a week with clean eating. I will be eating fish so, that counts me out for the meatless portion. Well, 2 out of 3 is still good!!!! Good luck ladies. I WILL BE STARTING BUT NEXT WEEK. THIS SOUNDS LIKE AN AWESOME CHALLENGE. ESPECIALLY WITH BLACK WOMEN COMING TOGETHER TO DO THIS. I’m in. Ill do the excercise and clean eating…ill try to go meatless but it will def be a challenge! Just the jumpstart I needed. I’m in. I’m in….I haven’t eaten red meat for years but I welcome the challenge! I am in! I will eat clean, exercise for 5 hours a week. I will be as meatless as possible, so I will start off with grilled chicken and fish only. Definitely no red meats or fried meats! I am excited to start this challenge. I will be including my Husband in this as well. Great challenge….I’m definitely in. I’m already doing two out of the three somy challenge is the working out 5 hours a week. This will keep m accountable. l.
I’m in for all three. im so xcited im doin alllllllllllllll 3 lets gooo ladies! Hi I plan to attempt to eat meatless Monday-Friday, limit my processed foods, and I already excercise 5 hours a week, so of course I am going to do that. This challenge is going to be hard, but wish me luck. I wish all of you luck too! We can do it! OKAY I’M IN!!!!! No red, pork or chicken meats, will do fish not fried though, and count me in for the clean eating and 5 hours each week!!! This will be my first challenge but if I want something different I have to do something different!!! Let’s Go ladies!!! OK I am in, all three, HUGE challenge for me. I’m committed to all parts of this challenge. I know it will be tough but I’m ready for the challenge! I think I can do the clean eating and 5 hours of exercise a week.. I need to reboot my routine so I can see more weightloss….this just might do it! Perfect after surgery challenge to re-start my system. I’M IN! I’m all in!! I am going to eat eggs tho with Vegan cheese. One question though, is 12 grain bread ok?? I’m so stoked!!! This will be my first CHALLENGE and I’m ready to take it on! I am COMMITTING to all three…meatless “@_@”, clean eating and 5 hrs (or more) a week. I am excited to join everyone for the October’s challenge. I will eat fish though! Good luck everyone!!! Soooo… God willing, I am going to give clean eating & 5 hours of exercise a go!!!!!!!!!! Here we go again. I’m a go for the Oct challenge, but I will also add fish. Hope this month I can actually lose some weight. I will do all three!! I’ve been giving meat a lot of thought lately. Why is it so hard for me to give it up? Compared to the wide variety of flavors and textures in vegetables, fruit and grains, there are only four flavors of meat; chicken, beef, pork and fish. What we end up doing to make it more flavorful is marinate, season, smoke, fry, bbq, bread it, sauce it, grind it, beat it, shred it and pull it. Any food that requires that much preparation must not be very tasty in its own right. And i don’t even want to get into the hugh amount of energy, vitamins and minerals we sacrifice to digest it. So, yes count me in for not eating meat, eating clean and excercising 5 hrs week. Same here, its a big struggle for me and meat. I have always loved meat more than any food so this is going to be difficult but I will try my best. Good luck! I have actually been meatless already for a week. I was only doing it for 3 weeks. after my 3 weeks are up I will do clean eating. I WANT SOME MEAT!!!! I have already been doing the 5 hours of exercise so I am in! And btw this first week of going meatless I lost 9.4 pounds! I have already started a meatless journey a week ago with the Eat to Live book and diet, so this challenge is right on time. Count me in for all 3!!! This will be my 1st challenge I am going to take on clean eating for the whole month of October. Doing the clean eating challenge and 5 hours of exercise with my family! Super excited!!! I am going to do all 3. Count me in! Not good at commitments but count me in for the challenge. My life is at stake! I’m in for the meatless & 5 hours a week exercise. I am going to commit to all 3!!!! I am going to commit to clean eating and the 5 hours a week exercise!!!!! I know that this won’t be easy for me, but I’m willing to try. Count me in….let’s get it!!!!! I’m ALL in…I’ve been trying to go vegan and have been about 80% effective…with the resources provided here, perhaps I can make it the rest of the way! Thanks for this challenge…started tonight with brown rice and veggies!!! Exciting!! I’m down for all 3!! This sounds doable. I posted once that I was working on a plan…well…turns out that Some family members are relocating to my area. We’ve agreed to split into teams, and see who can lose the most in six weeks! I’m going to present this to them when they arrive, and see if they are willing to incorporate this into our competition. It’ll be interesting to see who gets busted at TacoBell first…lol! I’m ready to give it a try! I’m ready!! Sounds like fun. I will complete all three plus 10 hours of exercise. Awesome! Congrats on 29 pounds!! Clean eating & 5 hours! All 3! Excited and committed! Looking to see a big change! Thanks for this website! I am definitely in. Thanks for the challenges!! Clean eating and 5 hrs. I will also go meatless three days a week. Well this month is going to be my first month beginning the challenage. It seems like I may have joined on the hardest month however I will do what I can. I am encouraged by others stories and I know myself too can do it. I have been down this road before and I need to buckle down and get focus and watch what I eat mostly, and exercise and I will begin to see the pounds melt away. Currently I hate my self image and I need to do something about it, also I can’t fit any of my clothes and I refuse to buy new clothes because I have wayyyyy to many in closet. So its time to loose weight, I just need help with accountability and having to check iin with someone. Can someone help me with that? I am so glad I came on this site. I started the no meat and exercise for my challenge but I didn’t know no meat mean no fish, so here on out no fish as well. Lord help me. Hey LaShena, You can have fish if you decide to. It still falls under clean eating so you’d be doing 2 out of 3. It is lean meat! I am committing to clean eating and exercising 5hrs/week. I can also cut out beef and pork…but gotta at least have chicken breast and fish. I love this site…also dedicating myself to logging in more frequently for support and good advice. Okay, I have not gone meatless any longer than three weeks before, but I really want to do this. I just bought Joel Furhman’s Eat to Live, and I am psyched about doing this… a little nervous too. I want to do it right! !I plan to stick to the exercise, five hours doesn’t seem like too much, but every time I commit life gets in the way. But I am determined!! 5 hours of exercise per week, I will go meatless at least 2 days per week also. I am so into this,am doin the meatless one..body needs a good clean out…wish me luck!!! THIS SOUNDS LIKE A GREAT CHALLENGE I WILL TRY IT LORD KNOWS I NEED TO DO SOMETHING. JUST NEED THAT FIRST PUSH TO GET STARTED……. I am going to try the clean eating and working out 5x’s a week for October! I am excited to say that I too will participate in the clean eating approach with mainly fish, low fat dairy, fruits and vegetables, as well as working out 5x’s per week in October! I have been doing all 3. I really love the Spinach and Oatmeal smoothies in the morning. They are very filling. I look forward to the next 24 days of this month for the challenge! I had a great week with the food. I have a full glass of water in the morning, then I drink my smoothy, lunch I had salads or veggies. I am spending more time in my kitchen because I am making my own food. I set myself to weight every monday but I could not resist I weight myself today and I am already 2 lbs down. I had about 4 hours of exercise for the week. I hope next week I will put a little bit more and do the minimum 5hrs. I am committing to the 5 hour a week workout. I would love to go meatless for a month, but as part of my job I have to eat. I am committing to clean eating and at LEAST 5 hours of exercise per week. I am currently at a plateau and this will definitely get me past that. I am committing to 5 hours of exercise a week. I will try to cut down on the meat. I am a meat eater. This is my second week and I have lost 4 pounds already. I love meat….period. But I will try all three. I do two of them anyway and I will go without meat for atleast 30 days. Wish me luck. Felecia you are right when you say “with Gods help, all things are possible. Now I know i can do this. Doing two of the three meatless and 5 hrs of workout. This has been a great challenge with the change in the types of veggies and fruit….I am attempting the 5hr. exercise per week challenge. Have started slowly but surely. The last two weeks had been a challenge for me I’m not able to workout at this time, but I have lost twenty seven pound and I not stoping until I reach my goal. I also have maintain my good eating habits. I’m wanting to do this challenge. I must say it will be a challenge, but I’m in.. Hope I get plenty its motivation because its going to be hard. I’m not sure if what to eat. I do not like yogurt. Do anyone have any suggestions as to what type of things I could eatwith less sugar as far as snack. I didn’t stick to the clean eating plan very well, but I increased my activity overall this month and have another 6 lbs this month, so I’m feeling great!!! Looking forward to November’s challenge!!!!! I am all for this! I just stumbled across this blog and page on Facebook today. I will join the challenge. Good luck ladies!